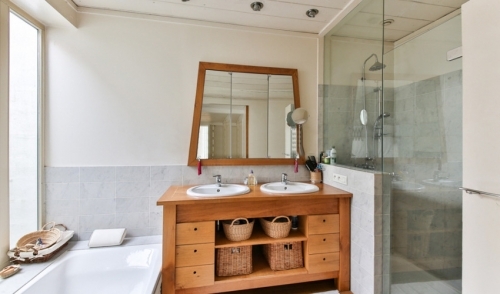 Although master bathrooms continue to be one of the most popular rooms to renovate, the features within the spaces have evolved over the years. According to the 2017 Houzz Bathroom Trends Study, released today, statement showers with more square footage, high-end features, such as rainfall showerheads, and accessible amenities are some of the most preferred additions in remodels. Idea generator website Houzz surveyed roughly 1,200 users who completed a master bath renovation in the last 12 months, are currently working on one, or are planning to start one in the next three months. The 56-question survey found the average overall spend, between all age groups, on a master bathroom bigger than 100 square feet is $21,000. To make room for a larger shower that can accommodate two people, 27% of homeowners are removing bathtubs from their master bath. In the 2016 study, 20% of owners wanted a shower for two, but this year 24% are looking for a dual shower. In the case homeowners want a tub in their bathroom, 37% are adding or replacing the soaking amenity. Among them, two-thirds are opting for a soaking tub and 43% a freestanding flat-bottom. Besides additional square footage, three in four renovating homeowners are looking to add higher-end features inside their showers. Rainfall showerheads top the most-wanted feature list with 55%, while curbless showers (21%) and bodysprays (18%) follow behind. With more money being allocated to shower spaces, homeowners are looking to save on sinks (10%), lighting (14%), and toilets (16%). Mobile device use in bathrooms has increased from 58% in 2016 to 64% this year. Although millennials are twice as likely to use their phones in bathrooms compared to baby boomers, the top phone activities across all ages are checking email, reading texts, or making phone calls. As the industry continues to develop more high-tech products for bathrooms, the survey shows demand for these type of additions has increased. Self-cleaning toilets, digital controls, and mood lighting are some of the more popular, but toilets with bidet features and showerheads with LEDs or speakers were also listed. When homeowners look to renovate their master bath, 90% are looking to change the design style. Currently, the most popular master bathroom style is contemporary with 25% and is followed by transitional with 17% and modern with 15%. As for color, white continues to gain popularity this year with 38% of cabinets and 40% of countertops using the neutral. Dark wood cabinetry and multicolored countertops have become much less common. To contrast the white, gray tops the list for most often used color on bathroom walls (35%) and floors (31%). For owners who are 55 and older, universal design features, like grab bars, seats, and curbless entry, are also important. For showers, the top features include seats (53%), grab bars (33%), curbless entry (25%), and a footrest (13%). For bathtubs, the additions vary slightly with grab bars (22%), non-slide floors (18%), seats (8%), and walk-in tubs (1%).